The first floor offers a cozy living room centered around a fireplace and built in bookcases, a comfortable master bedroom with queen bed and ensuite bathroom, and a full kitchen with eat-in dining for two. Upstairs are two additional bedrooms, one with a king bed, the other with a queen and twin bed, both rooms with their own ensuite full bath. 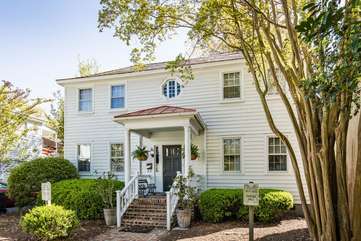 Fully-appointed with luxury linens and towels, TVs in each room, and a unique Charleston feel, MUSC Guest House can be rented as a whole house or per room for visitors of MUSC. For safety of our guests, we have keyless entry locks on all bedroom doors and the main door of the home for those renting per room. Off-street parking is provided directly in front of the home, with three dedicated spaces. Please note before booking that the Wickliffe House, a restaurant and event space, is located on the same property which occasionally hosts private events.